Jimmy Midjawmidjaw is one of the most recognised artists to have been working in western Arnhem Land from the 1940s onwards. During the 1960s he was among a group of artists, including Paddy Compass Namatbara and Yirawala, who were painting at Minjilang (Crocker Island) in western Arnhem Land and developed their own unique style. Their works are distinguished by strong fields of colour, bold outlining in white pigment and animated forms, as seen in 'Untitled (kangaroo)' c1960. 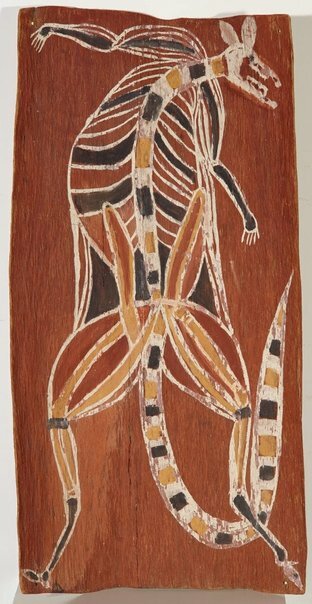 'Untitled (kangaroo)' c1960 is a rare example of the old style of western Arnhem Land bark painting before rarrk (crosshatching) was introduced. Today works from wenstern Arnhem Land are distinguished by the vast field of intricate rarrk that cover entire works. The style of painting seen in 'Untitled (kangaroo)' c1960 appears to represent variations of ceremonial body paint and is derived from paintings on rock shelters, caves and galleries found in the Arnhem Land escarpment. While this work references the well known practise of so called X-ray painting, this work is much more than a simple rendition of anatomy. Midjawmidjaw has contorted the body and given precedence to the body and legs to show the strength of this kangaroo, who appears as though weightlessly dancing on his toes.